The Lower Right was pretty different from On The Table. It's in the basement under a Hub pub and is aiming for a slightly different type of salaryman. The prices and atmosphere were the main contrast from our previous stop. - Definite basement business bar feel to it. Big high leather bench seats. Pretty tightly packed in. Can imagine it feeling quite lively when it's packed. When we visited in the afternoon we were only able to stay for one beer as they were fully booked from around 17:30. So, it's definitely popular. Seating for 30 and a counter for around 10. - Big smoke stench coming from the walls and furniture. Even though we were the only people in there, it felt a bit stinky. And the place hasn't been open that long! 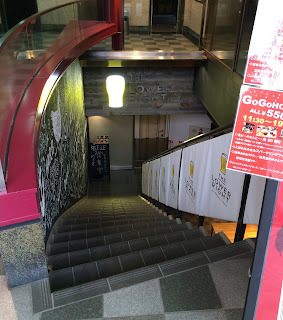 - 20 taps, two of which are macro, eight fairly run of the mill Belgian beers with a few highlights and the remaining ten are Japanese craft of the cheap keg variety. Some decent beers on from larger breweries, (Nest, Baird, Ise Kadoya) and some darker stuff from breweries you don't see around that much. We went for a couple of the less well know breweries and one was a pleasant surprise. - Japanese beers are in two sizes, 270ml and 450ml. Prices for these are ¥580 and ¥880 respectively. Belgian beers normally come in the one size in the correct glassware. So probably around 350ml. Pricing ranges from ¥750-¥950. They have a happy hour from 11:30-19:00 where all beer (we think... definitely the Japanese stuff anyway and we suspect the Belgian stuff too) is ¥550. There is no cover charge but tax is added on to your bill at the end. One other option they offer is a beer flight of any three beers on the menu for ¥880. Not sure of the size of the servings though. Overall, positives are pretty good pricing, 'interesting' beer selection, daytime opening, but the negatives are smoky and busy and 'interesting' beer selection.